#SurpriseTheStruggling – We Meet The People Where They're At…PERIOD! 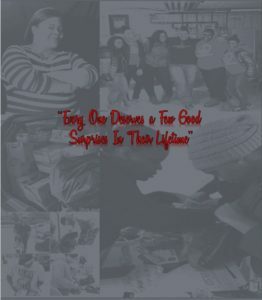 #SupriseTheStruggling™ Inc.—a 501 (c) 3 non-profit global hashtag movement with a growing number of Ambassadors across the nations is aimed to assist homeless women and girls globally. Volunteers and Ambassadors across the globe are filling new and lightly used purses with toiletries that will help homeless women and girls hygienically take care of themselves. Thank you for stopping by our page to learn more about who we are and what we do. We are here to help serve the homeless in our communities. To aid them during their time of need. Hopefully, helping to make one less concern for them while they are working towards making a better life for themselves and their families. One act of kindness can make a world of difference. Many are just one paycheck away from experiencing homelessness. There is a stigma that comes with being homeless; especially for women. It is often difficult to provide for the basic necessities that so many of us take for granted each and every day.